The owner of a Massachusetts bookstore investigates the murder of a private-duty nurse. When British-born Gemma Doyle opened the Sherlock Holmes Bookshop and Emporium, her goal was to pay homage to the Great Detective, not to become a sleuth herself. But when a customer stashes an 1887 edition of Beeton’s Christmas Annual in the shop’s shelves and proceeds to get herself killed, Gemma needs to act. First of all, she learns that Mary Ellen Longton was at the bedside of famed Holmes collector Kurt Kent Jr. when he died, so it’s a good bet the copy of Beeton’s is worth big bucks. Second, Detective Louise Estrada, who’s partnered with Gemma’s old flame Ryan Ashburton, seems to like the Brit very much for the murder. Not that there aren’t a slew of other suspects: Kurt’s son, Colin, who’s hopping mad that his late dad may have given the valuable journal to his nurse; Mary Ellen’s hard-up son, Roy, who’d like a slice of his mom’s action; or Kurt’s daughter-in-law, Elaine, who bears a strong resemblance to a customer who visited the emporium the day before Mary Ellen’s death. Still, as Estrada zeroes in, even her best friend, Jayne Wilson, co-owner of Mrs. Hudson’s Tea Room next door to the emporium, advises Gemma to put on her deerstalker and crack the case in a hurry. The heroine isn’t quite likable enough to support such a lengthy debut with such an extended cast of undistinguished characters. 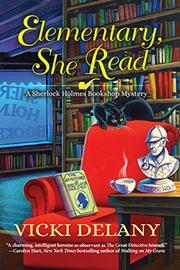 The result is more likely to appeal to small-town-sleuth fans than true Holmes aficionados.